The Official Cribbage Pro Blog. Read updates from the Cribbage Pro team about new releases/features, answers to common questions and detailed cribbage strategy. Download Cribbage Pro now! We’ve received a couple of statistics questions recently from Cribbage Pro players. We love getting these types of questions, and to show our appreciation we’re devoting this week’s entry to their answers. As usual, all the numbers in the blog post come from our sample of several million cribbage hands. There’s some overlap in these numbers – a hand could hold a flush and a run, or a pair and a run. Interesting to see that double double runs (for example, 4-4-5-5-6) are more common than triple runs (like 4-4-4-5-6). The bars for 5, 7, and 8 fifteens in a hand are too small to be visible, but it’s still possible to count 5, 7, or 8 fifteens in one hand. About one hand in 800 has 5 fifteens, one in 600 has 7 fifteens, and one in 15,000 has 8 fifteens. 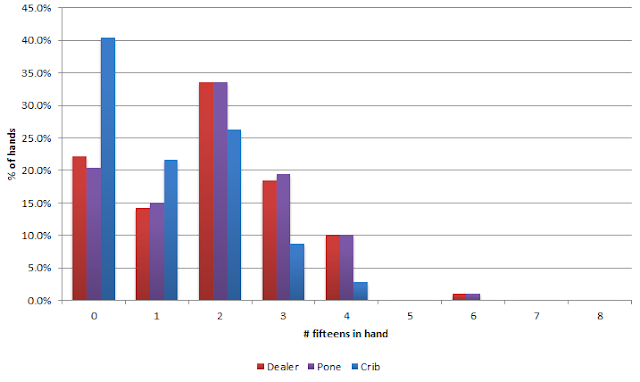 Note that only 20% of dealer or pone hands have 0 fifteens, which means that most hands have at least one fifteen in them. Not only that, most hands actually have at least two 15s in them. Put those all together, and how many points do you get? You get this! Points per hand look fairly similar for dealer and pone. The most common number of points in a hand is 8. 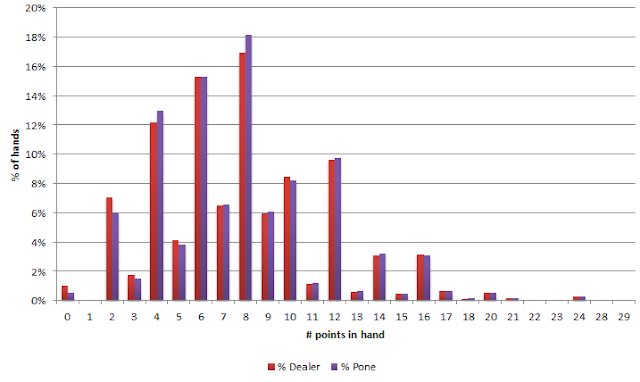 Dealer’s hand holds 8 points 16.9% of the time, and pone’s holds 8 points 18.2% of the time. Hands with an even number of points are more common than hands with an odd number of points. Looking at the first table explains why – most hands have pairs and 15s (which score even number of points), while only 23% of hands have single or triple runs (which can score an odd number of points). It’s impossible to get a 19, 25, 26, or 27 point hand, so those entries don’t show up in the chart. 22, 23, 28, and 29 are possible, but show up so rarely that their bars aren’t visible. About one in 15,000 hands on Cribbage Pro scores 28 points, and about one in 220,000 scores 29 points. The typical crib doesn’t have as many points as the typical hand, so this next chart looks a lot different. You can score more than 16 points in a crib, but we left those bars off because those scores happen so rarely that you wouldn’t be able to see them. Only about 1 in 1,000 cribs scores more than 16 points. 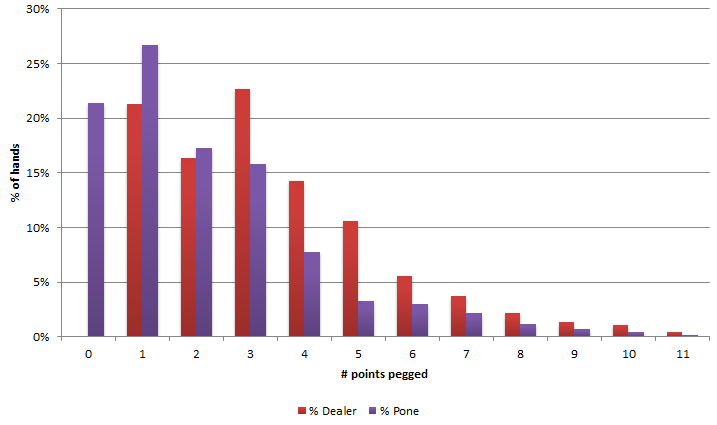 Dealer always pegs at least one point, so dealer gets 0% in the “0 points pegged” column (we’ve excluded hands where pone pegs out before counting). The most points we’ve seen pegged in one hand is 29, and in the millions of hands analyzed for this blog, this has only happened once. In that hand dealer and pone each held two aces and two 2s. Ouch. Thanks for the questions, Kip and Zerrick. We know more of you have questions, and we’d love to answer them. Just leave us a comment below. Editor's Note: This is a guest post by Aaron Harsh continuing the series on cribbage strategy and tips. Aaron lives in Portland, Oregon with his wife Stacy and daughter Audrey. He spends his evenings analyzing cribbage strategy for Fuller Systems, and his days analyzing television viewership for Rentrak Corporation's Advanced Media & Information group. You can play him on Cribbage Pro Online as user "aaronhars", or in person at American Cribbage Congress grassroots club #28 (Oregon's Finest). Logically the stats are right on but its great to see that sort of drilling down. I love crib (Cribgenie is my playing name) but I dont get into the nuances so easily; e.g. Getting my picture up, but who wants to see a retired Englishman? So a basic, but not too basic intro to Pro Online Crib would be helpful. Is the one already? Again thanks for the data, will lok more often now. How Should You Respond to Pone’s Lead? Copyright Fuller Systems, Inc. All Rights Reserved. Simple theme. Powered by Blogger.